2nd August 2015 – At the notoriously tough and competitive Kenyan trials for the World Athletics Championships, Vivian Cheruiyot (KEN) and Nancy Chepkwemoi (KEN) both confirmed their selection for the team with strong performances in Nairobi. For both athletes it is welcome return to the top level of competition after some time away from the sport. Vivian bided her time in a slow and tactical 10,000m but was able to remind those watching of why she is known as the Kenyan ‘pocket rocket’ with a good turn of speed over the final lap to cross the line first in 32:58.4. She will now look to add to the three world titles she has won previously. Nancy had to fight all the way to the finish in her 1500m final but after a series on unbeaten races in Europe just last month she deserved to take the final qualifying place in third with a time of 4:04.67. 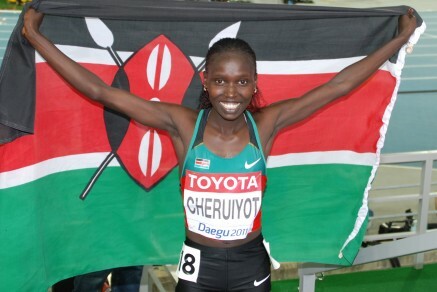 Athletes just missing out on selection were Magdalyne Masai (KEN) and Winny Chebet (KEN) both of whom finished fifth in their respective events of 3000m steeplechase and 800m. In Ninove Tom Lancashire (GBR) ran a seasons best of 3:38.09 while finishing fourth in the 1500m. On the roads in the US the PACE duo of Moses Kipsiro (UGA) and Micah Kogo (KEN) both featured at the front end of the Beach to Beacon race. Kogo, a former winner, had to settle for fifth on this occasion and although he found the undulating course tricky Kipsiro still had enough speed towards the end to take second.